Mentalism is a performing art that focuses on the mind and imagination. When performed correctly, mentalism can make the performer appear as if he or she possesses extraordinary powers or incredible mental prowess. Practitioners of mentalism will usually avoid mixing traditional magic tricks and theatrical props into their act. Instead, mentalism focusses on things like mind reading and predicting the future. This is why many mentalists do not consider themselves to be magicians. How do mentalists trick the brain? Your brain is an amazing organ, capable of processing vast quantities of information via your senses to present you with the world you see, hear and feel around you. That said, your brain is also incredibly easy to trick. 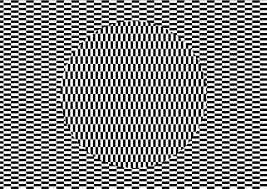 For example, the image below appears to be moving, when in reality, it's actually completely motionless. Scientists aren’t even sure why this happens, but the effect is easily replicated, as I’m sure you’ve seen countless times online and on social media. You’ve probably also heard of the placebo effect, where a sugar pill or saline injection is given to patients along with an assurance that the “treatment” will make them feel better. You’d think that the placebo would have no effect, but in many cases, the patient's condition actually improves. Some people can also be easily influenced into believing in paranormal coincidences and synchronicities, such as frequently seeing the number 23 or 11:11 throughout the day. When in reality, it's far more likely that they are experiencing a simple case of confirmation bias. The above examples show you just how easy it is to not only trick the brain, but also how a powerful suggestion can actually influence our decisions, and potentially, our physiology. This is the very foundation of mentalism, where the choices that we make are rarely what they seem! Suggestive magic can be traced back thousands of years in one form or another, with seers, oracles and practitioners of supernatural feats mentioned throughout the Bible and in ancient Greek literature. One of the earliest “modern” examples on record is the work of an Italian man named Girolamo Scotto, who is credited as being the pioneer of sleight of hand magic back in 1572. This type of misdirection is now often used by mentalists to enhance their apparent feats of mental prowess. In more recent times mentalism has evolved to include many other forms of performing arts, such as cold reading, telepathy, hypnosis, rapid maths, clairvoyance and even psychokinesis. All of the above share similar roots in misdirection, the power of suggestion and the ability to read body language. The interesting thing about mentalism is that with enough practice the skill can become almost automatic. The magician Orson Welles famously explained this using the hotel clerk example, where he described how staff in a hotel might assess a guests wealth based on how they dress. This would then be used to determine what kind of room to give to them. At first, hotel staff would try to sneak in a quick glance at a guests shoes or estimate the value of their luggage. Over time though, these sneaky glances were no longer necessary. The skill had become so well practised that it was actually happening automatically without any conscious thought. This is perhaps why some mentalism practitioners such as Derren Brown are so adamant that their skills are completely natural, as they are fully aware of the practice involved. It could also be why some traditional performers such as Joseph Dunninger were able to convince themselves that they genuinely possessed genuine superpowers! As we’ve already mentioned, Derren Brown is perhaps the most well-known modern day mentalist, with his popular Tricks of the Mind TV series and other shows. Some of his tricks have involved stunts such as convincing someone that they are actually inside a video game, as well as attempts to trick the public into believing they are stuck inside their seats. Uri is also very much a household name thanks to his many demonstrations of spoon bending. Though an interesting fact about Uri Gellar is that there is some evidence to suggest that he was actually employed as a secret psychic spy for the CIA. Bob is also a well-known and much missed American mentalist and one of the founders of the Psychic Entertainers Association. Unlike many other practitioners, Bob was quite vocal about how anyone could learn how to become a mentalist and even wrote 37 books on the topic, in the hopes of educating people about it. There are also some examples of mentalism being used for more sinister purposes rather than entertainment. This includes Erik Jan Hanussen, who is alleged to have influenced Adolf Hitler, and Wolf Messing, who is believed to have had a hold over Joseph Stalin. The great thing about mentalism is that with a little bit of practice, you can easily learn a few tricks at home to impress your family and friends. Here is a couple for you to try. Write the word carrot, or better yet, draw a picture of one on a piece of paper and keep it inside your pocket. Ask someone to sit down, close their eyes and clear their mind. Explain to them that they really need to concentrate on your instructions for this to work. Instruct the person to count backwards out loud from 100 while also visualising the numbers inside their head. Allow them to do this for about 10 seconds then ask them to name a vegetable. In the majority of cases, they will say the word carrot. You can then present them with the piece of paper showing the carrot. By asking the subject to focus on a task, such as reciting numbers, you’re distracting their brain with something analytical. Then, by asking them to name a vegetable, you’re suddenly forcing their brain to switch into imagination mode. The reason why a carrot is chosen so often is because for many people, a carrot is the most common vegetable in their diet when growing up. Just don’t try this one on someone that hasn’t grown up in the UK as often they will have grown up eating far more exotic vegetables than the humble carrot! For this to work you’ll need a packet of crisps that you haven't handled. Otherwise, it will raise suspicion. This is why this trick is best performed at a bar, or when someone is about to purchase a packet of crisps from a vending machine. Personally, I prefer doing this at a bar as it's a great way to win yourself a free drink! Start by telling someone that you can name the day of the week for any date in the last 100 years. Before they can whip out their phone to test you, suggest that they buy (or borrow) a packet of crisps and read out the Best Before Date to you. Make sure you put on a bit of a show, furrowing your brow to show the strain your brain is under while muttering a few dates under your breath as you perform your “calculations”. Then just tell them it’s a Saturday and watch their face erupt in amazement as they check the date using their phones calendar. Almost all crisp manufacturers work on a production schedule that starts on a Sunday. So all of the products produced during that week will have the same Best Before Date, which is always a Saturday. Just remember to only perform the trick once, otherwise, you’ll get rumbled quite quickly. Part of the act could be that it places such a huge mental strain on you and can trigger a migraine. That part alone should be enough to win you that free drink!